Confidence allows you to own your mistakes, knowing that you are human just like everyone else. However, not everyone possesses this priceless character quality! Some women appear to be born with confidence, while others seem cursed to a life of consistently second-guessing themselves. The good news is, it can be practiced and learned over time! 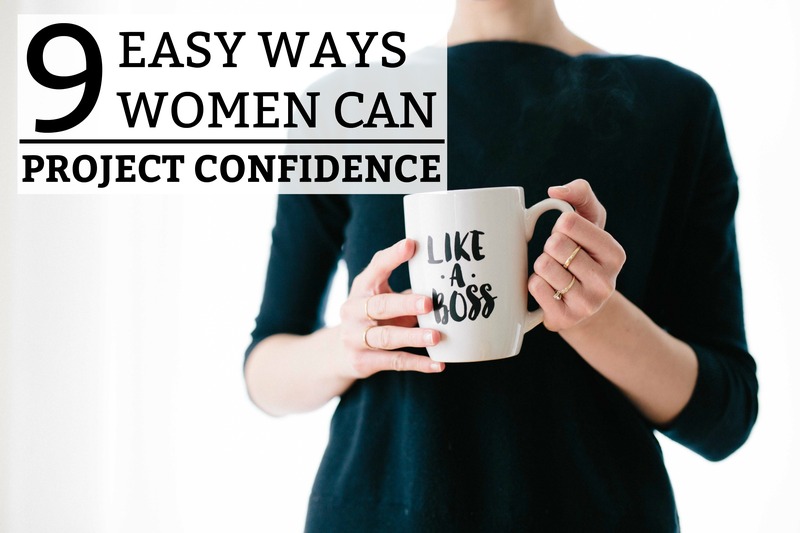 Below are 9 key ways every woman can project confidence! Sometimes, confidence has to be shown on the outside before it can be felt on the inside. Many women have quiet voices and agreeable, pleasant dispositions. Meaning – they would prefer to agree with an opponent or peer, as opposed to facing any form of opposition. They would prefer to smile and nod, as opposed to disclosing their own opinion. And they are easily interrupted and excluded from a conversation because their tone of voice is submissive and easily-walked-over. This does NOT mean that you have to be brash and rude to be a confident woman! It means that you have to know how to hold your own! This article will give you the proper steps to appear confident using body language. Your posture, eye contact, stance, speaking style, tone of voice, etc. – all these things will help you to project confidence from the outside! As women, we often make self-degrading comments to ease tension in an embarrassing situation or to help another person feel more comfortable. Why do we feel the need to say things like this about yourself? All this does is increase your self-doubt and point out your flaws to others. It is completely unnecessary! If you make a stupid mistake, fall off the treadmill at the gym, date the wrong guy, lose your job, or trip down a flight of stairs – it is TOTALLY OK! Don’t make fun of yourself. Laugh it off, hold your head high, and make a positive comment. Life goes on – everyone makes mistakes. If you can’t say anything positive about yourself, don’t say anything at all. Confidence starts with you and what you allow yourself to say and think about YOU! By nature, women are often kind and trusting. They are the first people to stop and help out a stranger or take on some responsibility to help someone in need. Many serial killers have played on the kind nature of women to coax them into situations that inevitably became their own death sentence. Woman always need to know how to be prepared! As women, we have to learn to say, “No!” We have to learn to decline requests, turn people down, and confront those who are unfair, disrespectful, and two-faced. The only person who can take responsibility for yourself is YOU! Arm yourself with the knowledge of what a toxic relationship looks like. This can be a family member, co-worker, friend, or recent acquaintance. Be selective with the things you take on and let others know when your workload capacity is maxed out or you are not able to do something. Otherwise, you risk suffering from burnout. Life will bring along wonderful people! Learn to hold onto them and celebrate them. However, you absolutely must learn to identify when someone is treating you in an unfair or disrespectful manner. This step goes hand-in-hand with #2! Stop making excuses for your daily decisions and life choices! Excuses show a huge lack of self-confidence. If you want to eat 3 donuts and a large frappacino, own it! Did you make a huge dating mistake? That’s OK – you don’t owe anyone an explanation/excuse! Have you not gone to the gym for 2 weeks? That is your decision, so don’t make an excuse for it! Were you lazy and didn’t finish a work or school assignment? Own your mistake and don’t make up a dumb excuse! Everyone knows at least one person who is a chronic excuse-maker! They have this unfortunate ability to make up a long and unnecessary excuse for absolutely every situation in their life. Don’t be that person. Own your decisions and your mistakes. When you realize that you don’t owe everyone an explanation, you will feel more confident and free! I’ve been here…and it is a difficult and unhappy place to be! Wondering what other’s perceptions of you are is completely normal! However, this habit can become an unhealthy obsession that will fill you with feelings of anxiety and self-doubt. You will over-analyze every comment, glance, and whisper. Your imagination will assume the worst and always ruin your joy! Your thoughts have the power to either increase your insecurity or increase your confidence! You must learn to focus your attention on other priorities – improving yourself and increasing your self-confidence. In the end, you are the one that has to live with yourself. You cannot please everyone – and you never will! Have you ever noticed how curious people are about everyone else’s private life? That is what keeps entertainment news networks in high demand! Everyone wants to know what is going on in the private lives of celebrities – all the nitty-gritty details that aren’t anyone’s business. Often, people will ask you point-blank nosy questions about your private life. Guess what? It is completely OK to decline to answer! That is the only answer you have to give them! Confidence is shown in the way you can stick up for yourself and your own preferences. If you don’t want someone knowing something about you, you don’t have to talk about it! When you gossip about other people, it shows others just how insecure you really are! Confident people know that if they point out the flaws in other people, it is done to simply make themselves feel better about their own inadequacies and flaws. Unfortunately, women do get a “bad rap” for spreading rumors and creating exaggerated stories. Don’t allow yourself to be known for this! If a rumor is passed on to you, let it die! Allowing gossip to become a part of your life can be very damaging to your credibility. Failure is a huge part of growth! There are so many people who want to start something or accomplish something, but they never do. Why? Because they are too afraid of making mistakes! However, you can always fix a mistake. But you can’t learn from something that is only conceptual – nonexistent. If you make a mistake, learn from it and move forward! If you make a mistake at the expense of someone else, apologize and take responsibility for your error. Don’t blame your mistakes on other people! This is a sign of insecurity and selfishness. People who blame-shift lose the respect of those around them and built an environment of distrust and resentment. The sooner you learn that and accept that you can make mistakes, the more confident you will be. This is probably the most valuable piece of advice in this article. No article will ever teach you everything you need to know about confidence. However, watching and learning from women that you admire will! Several years ago, I had a female employer who was the ultimate Girl Boss! She was young, smart, dedicated, kind, and confident. Her demeanor and leadership-style earned her the respect of her employees and peers, many of whom were older and more advanced than her. By watching her, I learned so many valuable tips about confidence – both internal and external. She walked confidently, spoke confidently, dressed appropriately, stayed consistent in her attitude and leadership style, didn’t allow people to walk over her, and carried herself in a way that demanded respect. She had a gift for leadership! However, I learned that everyone has to learn it from somewhere! Confidence and leadership do come easier to some people, however, it is always a learned trait. My final tip: watch and learn! It doesn’t matter what you personality is! Introverted, extroverted, calm, hyper – you can always learn to project confidence! Never allow insecurity or self-doubt to hold you back from your goals. Take the steps listed above and learn to be a more self-confident woman!